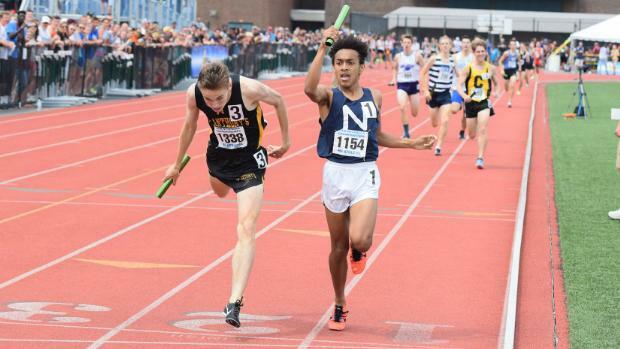 Where Have All The 4x800m Teams Gone? Three teams at 7:45 or under, including the State Record last Spring for the boys. There is an ebb and flow to all events in Track & Field at the State Level. One event may be strong enough where the previous years State Leader would have trouble making this years State Final, whereas others stay consistent for years and years. New York has always been strong in the 4x800m, in both genders. Much of that stems from the base training done by NY's exceptional record for Cross Country. It's the best indicator for the event, and with another strong year out at NXN, we're waiting for the 4x800m to follow suit. We're two days away from having the worst year for the event in over a decade, for both genders. In theory, teams hone their craft throughout the season, whittling down their Season Best, to culminate with a performance at either States or Nationals. One easy way to gauge where teams will end up, is where they start. And our start has been slower than any other in the past 11 years. Sub-8 minutes for the Boys, and 9:25 for the Girls are the magic marks, that indicate times are set to drop later in the season. The sooner it comes, the more time teams have to whittle those down even more. And in most other years, they've come sooner than Feb 2nd. Only one year, 2017 for the boys, saw the first Sub-8mins of the season come later than February 2nd. Arlington ran 7:55.30 at the Armory Track Invite that year, leading St. Peter's under as well that day. Warwick Valley had run 8:00.99 on Jan 11th of that year, the closest anyone had gotten until that point. For the girls, the latest a Sub-9:25 came was back in 2013, when Garden City ran 9:10.18 at the New Balance Games. It wasn't all bad for them, as they ran to US #2 to close out the Season with their 9:01 at NBIN. Our last hope comes from the Suburban Boys and Girls Champs, who run tomorrow. Saratoga Boys are the currently NY #2 at 8:03.36, while Shenendehowa leads the Girls at 9:25.64, less than a second off breaking the barrier. Both run tomorrow. We'll see if we get our first Sub-8 of the Season, or that sub-9:25 on Super Bowl Sunday.